Chops and tomatoes, ready for the oven. Spread the tomatoes in a casserole dish and set aside. 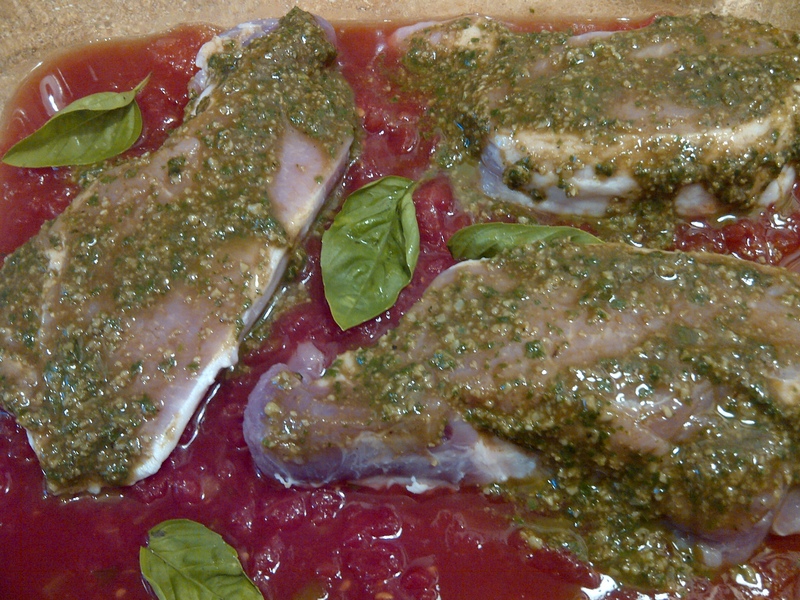 Combine pesto and balsamic vinegar; spread evenly over both sides of chops as well as the sides. 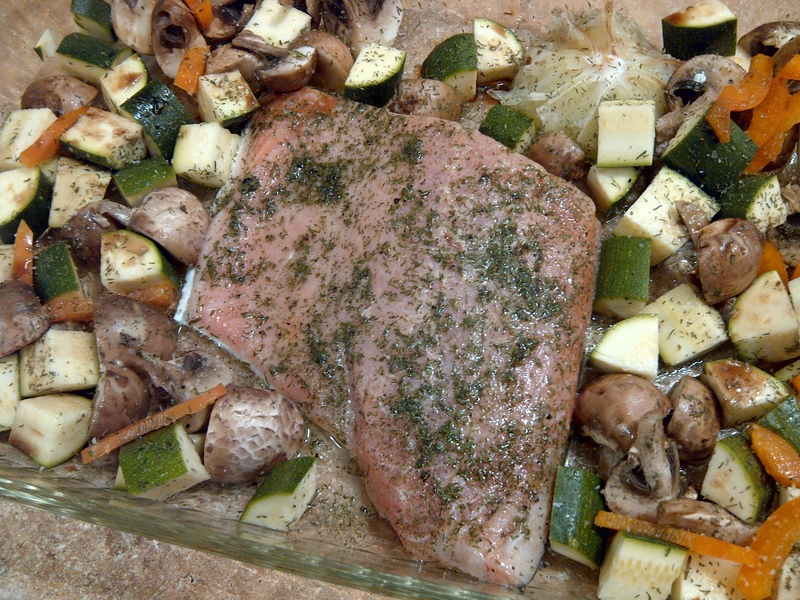 Roast for 35-40 minutes or until meat reaches 165-170 using a meat thermometer (or to desired doneness.) 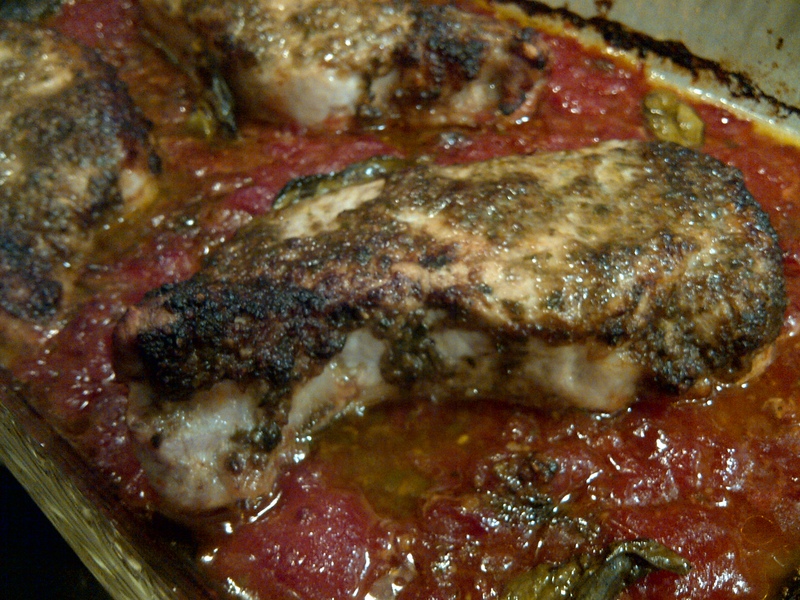 Remove from oven and allow to rest for 10 minutes prior to serving. (Also great on the grill.) Serve topped with the roasted tomatoes. 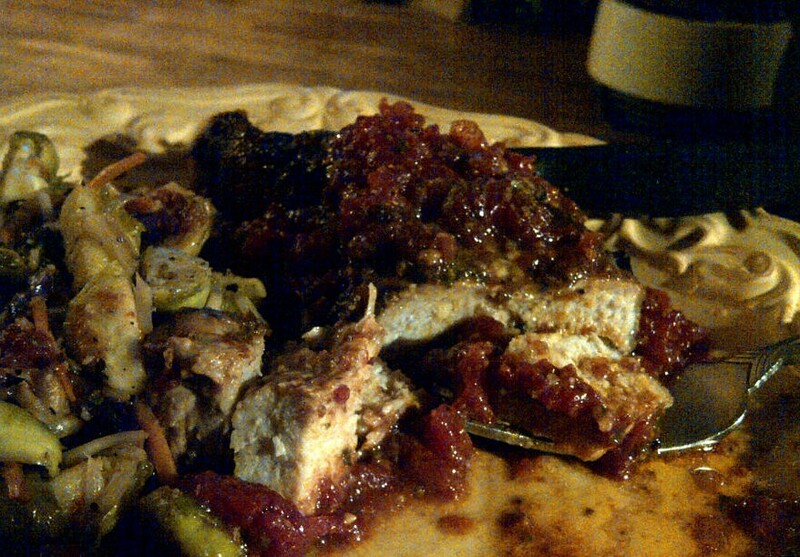 I served this with a side of sauteed veggies including broccoli, purple cabbage and brussel sprouts. I’m sorry for not getting a better photo of this all plated up, but it was eaten too quickly! Very juicy and tender, and incredibly easy. 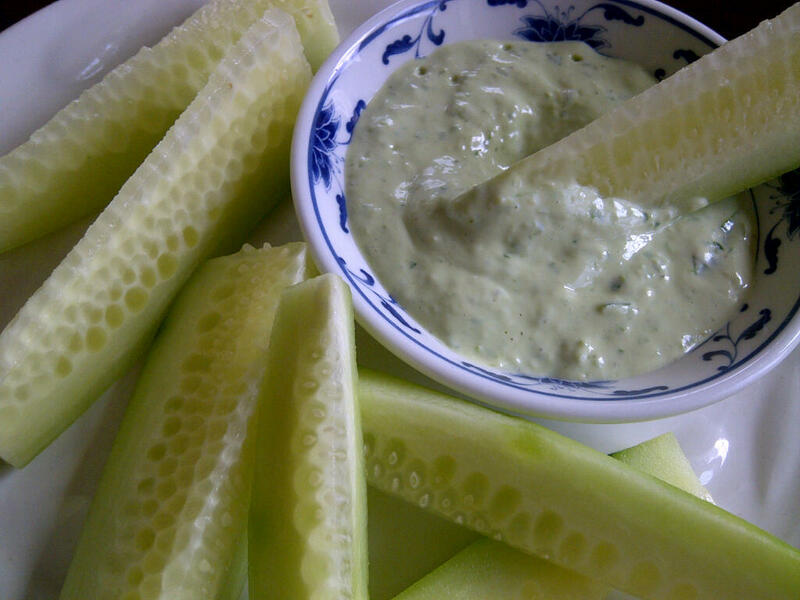 Great for a busy weeknight when you don’t have a lot of time to spend on preparation! 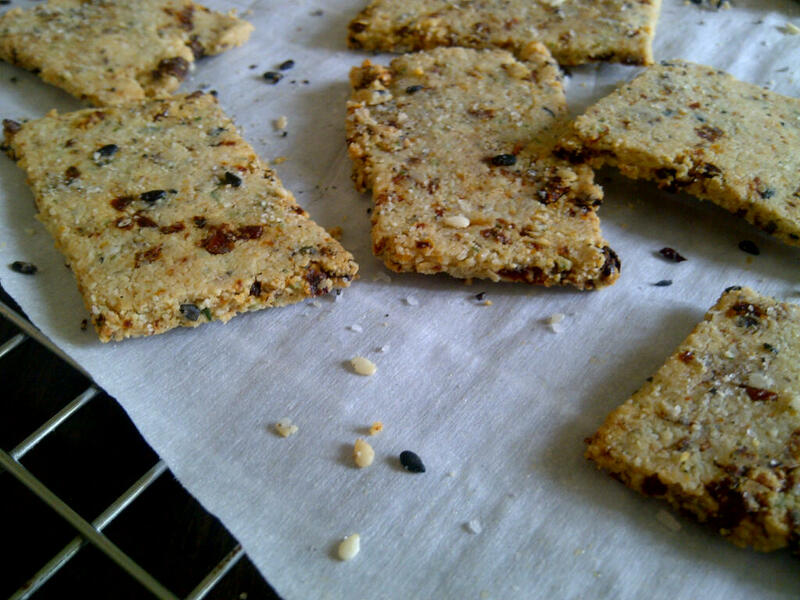 Sundried Tomato Basil Almond Flour Crackers. We haven’t had almond flour crackers in a while, so today I was thinking that I wanted to experiment with a different flavor combination. What came to mind was sundried tomato and basil, which is a classic pairing that we used to enjoy when we made home made bread (I know, I know… banish the thought!) The result was delicious! I also included homemade gomasio (sesame salt), since I just made a batch earlier today. 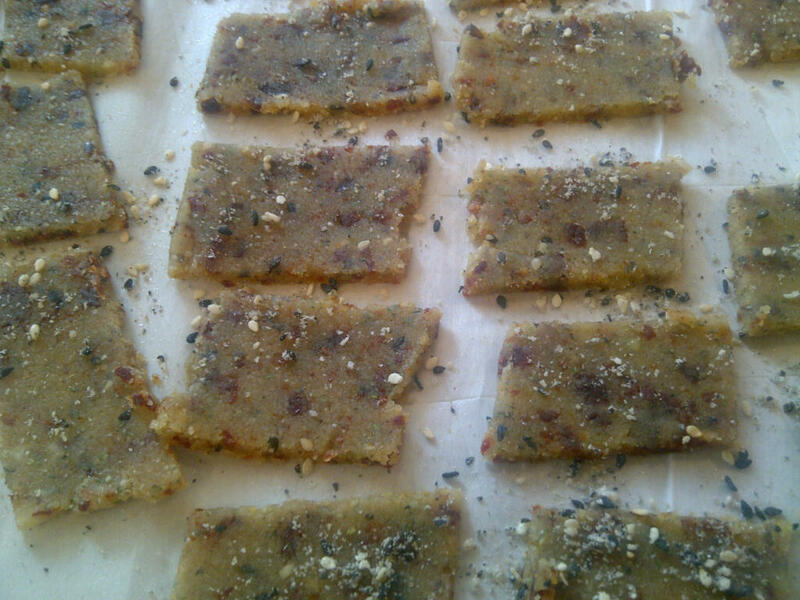 This is a slightly chewier cracker than the ones I have done before that include shredded cheese, but very tasty and satisfying. They are super simple to make, I hope you enjoy! 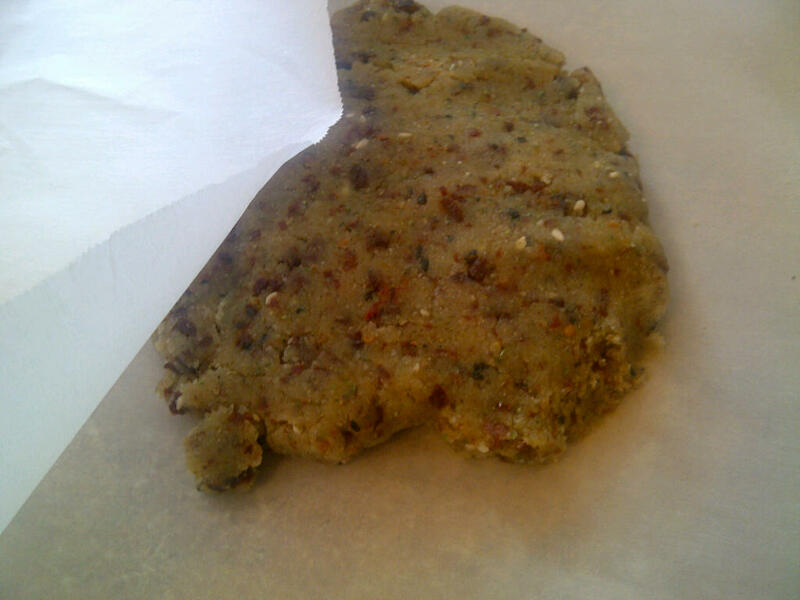 Cut into shapes, sprinkle with gomasio and bake per recipe instructions. Remove from oven and cool on wire rack. Don’t they look yummy?! 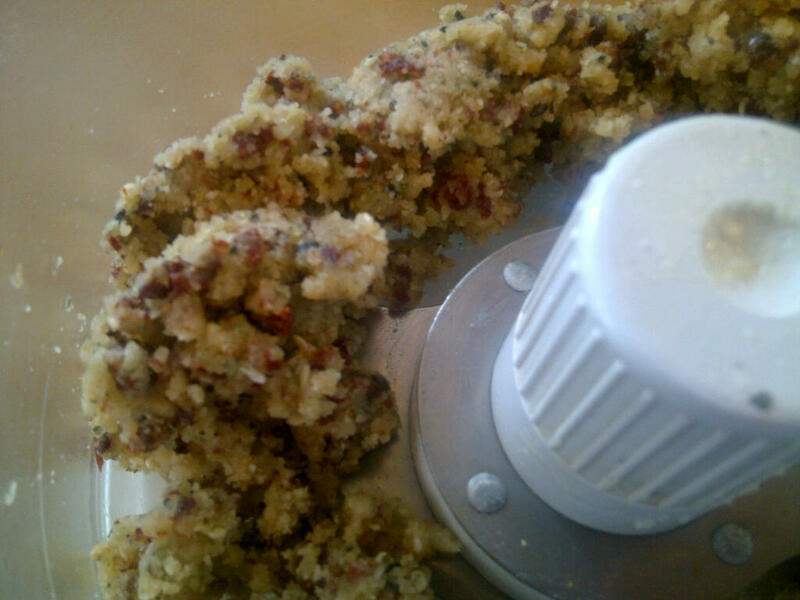 Combine all ingredients in a food processor and combine until the mixture comes together. Form dough into a ball and flatten between 2 sheets of baking parchment. Using a rolling pin, roll dough evenly until about 1/8″ thick. 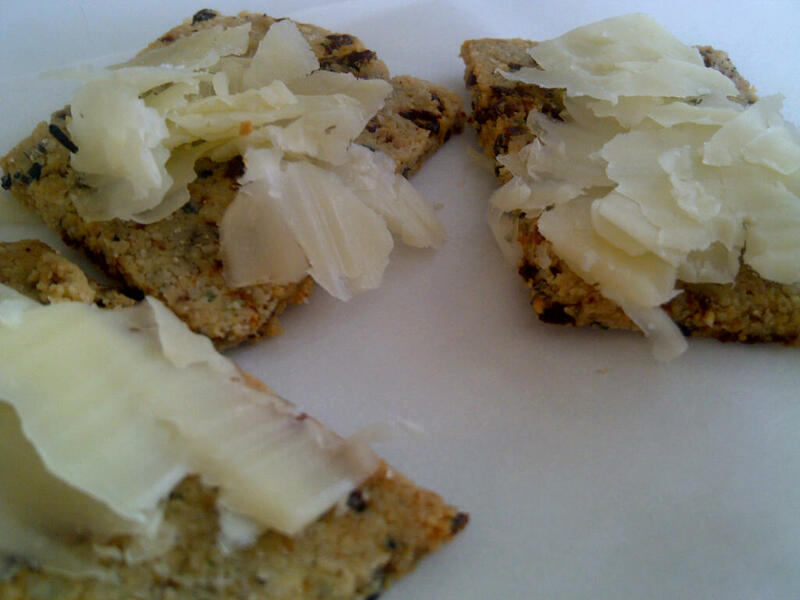 Gently separate crackers, keeping them on the bottom parchment, and bake for about 6 minutes. Remove from oven, carefully turn each cracker over, and put back in oven for an additional 4-6 minutes. 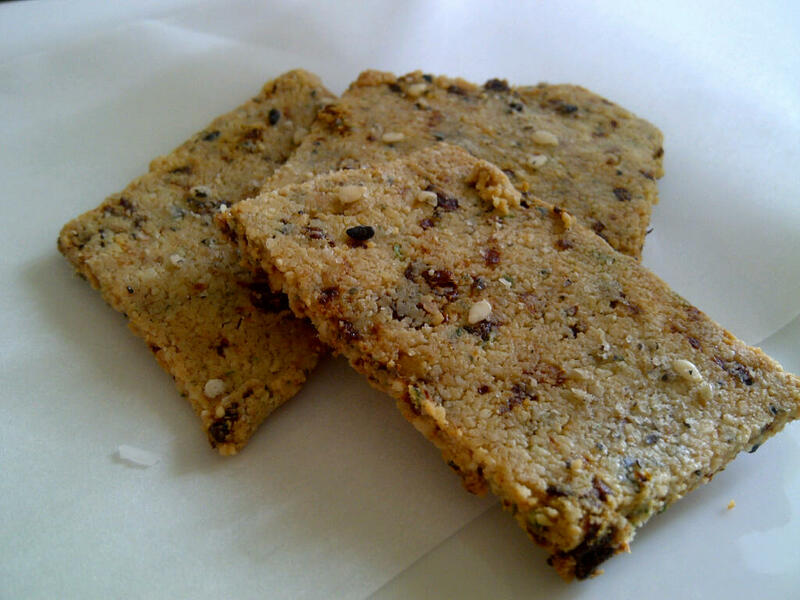 Watch crackers carefully, as almond flour can burn easily. Serve with cheese or toppings of your choice. We used extra sharp white cheddar today. Yesterday was a tough day… NO energy, extreme fatigue, ugh! It made me wonder whether I had accidentally ingested some gluten because “brain fog” is an understatement to how I was feeling! Without body aches and pains though, I had to think it was something else. One thing about going off gluten and eating low carb, is that my appetite isn’t what it once was, and I sometimes forget to eat… so last night my hubby busted me for not having breakfast and snacks during the day. It’s harder to eat when you’re not hungry! Today I decided to make sure I had a nice dose of protein to start my day, along with a few mineral-rich veggies tossed in to round things out. I can’t say yet whether it will get my energy back on track, but I am hoping so! What do you do differently when you notice that you are fatigued? Does it help you to address it with diet? Do you have any tips or tricks to share? I would love to hear them!!! Heat oil in a skillet over medium heat, and saute broccoli, mushrooms and garlic gently for a couple minutes, until broccoli is tender. 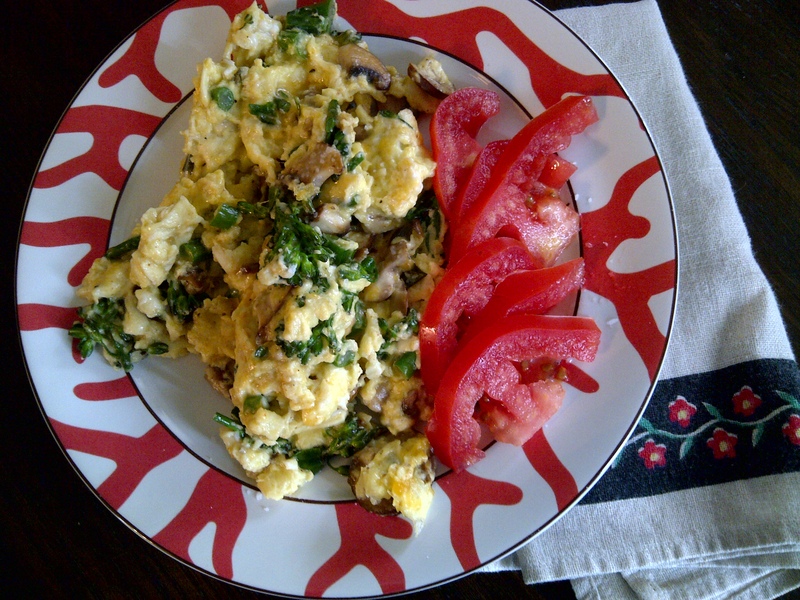 Beat eggs with cream and add to pan, scrambling just like normal scrambled eggs. 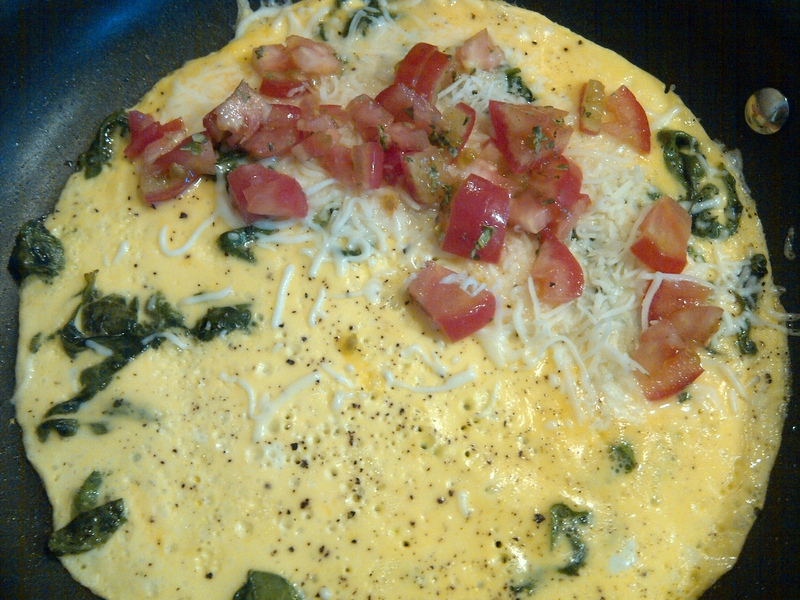 When the eggs are almost done, add the cheese and transfer to a plate along with the sliced tomatoes. 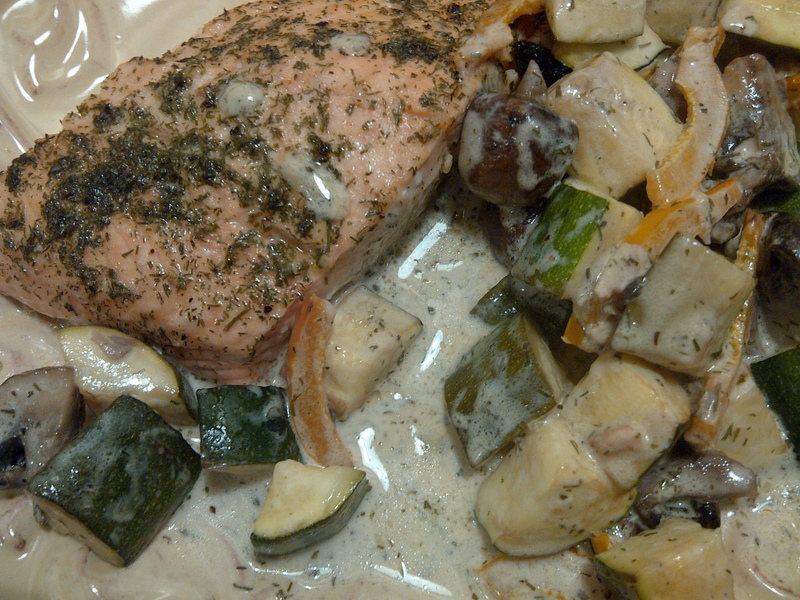 Here’s another easy salmon (or any rich fish) recipe… if you’re waiting for something more complicated, sorry! I tend to favor quick, easy and nutritious when it comes to weekday meals. I almost consider this more of a Method, than I do a recipe, because there are endless variations that I throw together depending what I have on hand. One of the reasons I like the fish and veggie combination, is that they can both cook together in under 20 minutes! Method: In this case I seasoned the salmon with extra virgin olive oil, dried dill and fresh lemon, along with sprinklings of other seasonings like garlic powder, onion powder, cayenne pepper, kosher salt and fresh black pepper. The veggies are 2 small chopped zucchinis, a cup or so of quartered crimini mushrooms (baby bellas) and 1/4 of a sweet orange bell pepper. The veggies received the same seasonings as the fish, with the addition of a splash of balsamic vinegar and then a few tablespoons of heavy cream in the last 5 minutes of cooking. The whole thing cooked at 400 degrees for about 15-17 minutes, with the cream added in at the 12 minute mark. It’s so quick and very tasty! 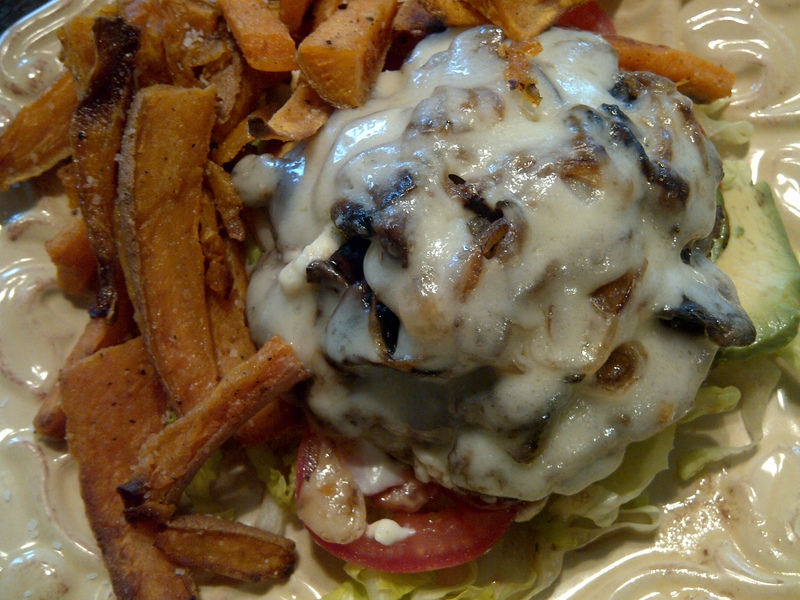 Burger Salad with Sweet Potato Fries is a great warm weather indulgence! It’s been one of those weeks, where finding time to sit at the computer has been a challenge, and even more so because we’ve been having broadband issues, which I THINK (after 3 service calls) are finally cleared up! With Spring being here in full swing, it’s been a lot more tempting to work in the yard and garden than do housework, or even cook… so the meals this past week have been incredibly simple and focused mainly on veggies. I didn’t want to bore everyone with images of all the steamed baby broccoli, zucchini, bok choy and sliced oranges I’ve been eating, so I waited until I had something a little more interesting or useful to post. So here it is…. Being beautiful outside leads to grilling, and grilling can lead to burgers, MMMM! As someone who doesn’t eat gluten, when preparing something like a burger, you have two main choices: bake or buy gluten free buns, or skip the bun entirely and rely on other things to make dinner delicious. Since we are striving for lower-carb, I skipped the buns this time and opted for a “burger salad”, and indulged in sweet potato fries as a side instead.YUM! Why Sweet Potatoes? Some people only think of sweet potatoes at the holidays, but they are truly a nutritional gold mine and can be incorporated more often. The glycemic load is 17 (lower is better), while a red potato is 26. Sweet potatoes are also known to be strongly anti-inflammatory, and choosing anti-inflammatory foods helps ease or prevent joint and muscle pain as well as ease digestive issues caused by internal inflammation. 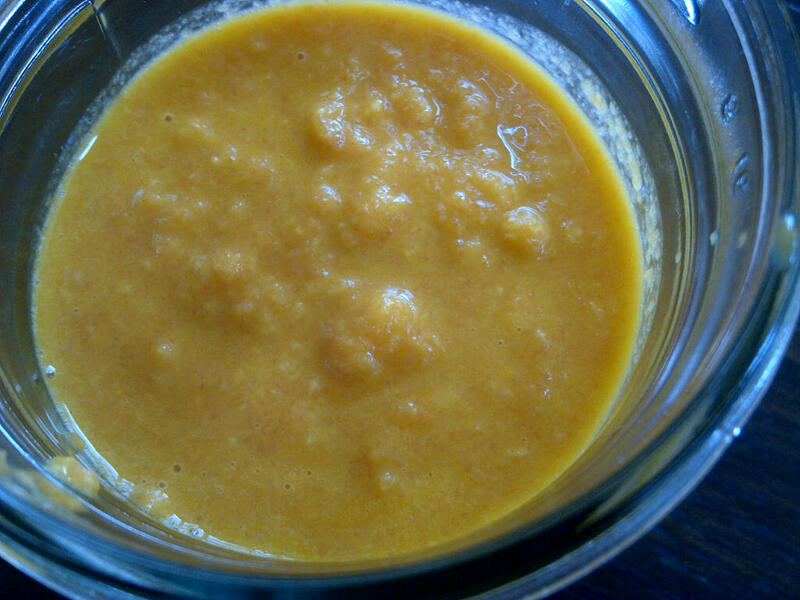 While it is definitely a carbohydrate, it is a good source of dietary fiber, potassium, B6, Vitamin A&C, and manganese. The Fries: If you haven’t made sweet potato fries before, I can assure you, it’s very easy and tasty too. 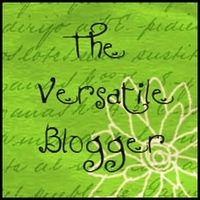 They are versatile as well. You can choose to cut them thick or thin, in rounds or sticks, and peeled or unpeeled. I choose unpeeled, medium thin sticks.You basically just bake them at 425 degrees for around 15 minutes, loosening them from the pan and turning them every 5 minutes or so. Be sure to coat them in olive oil, and I used garlic salt, onion powder, fresh ground pepper, and a dash of cinnamon to season these. Of course you can spice it up even more if you like, using cumin, cayenne or even chili powder, depending on your tastes. Super simple! If you want them ever crispier, you may choose to coat them with corn starch before baking, but I didn’t do that for carb reasons. The Burger salad: Is essentially a burger laid on a bed of salad that is made up of things that usually top the burger. In this case, after grilling (or baking, or pan searing) the super lean burgers were topped with a little blue cheese, sauteed onions and mushrooms, and covered with a slice of Swiss which I melted under the broiler for a couple minutes. 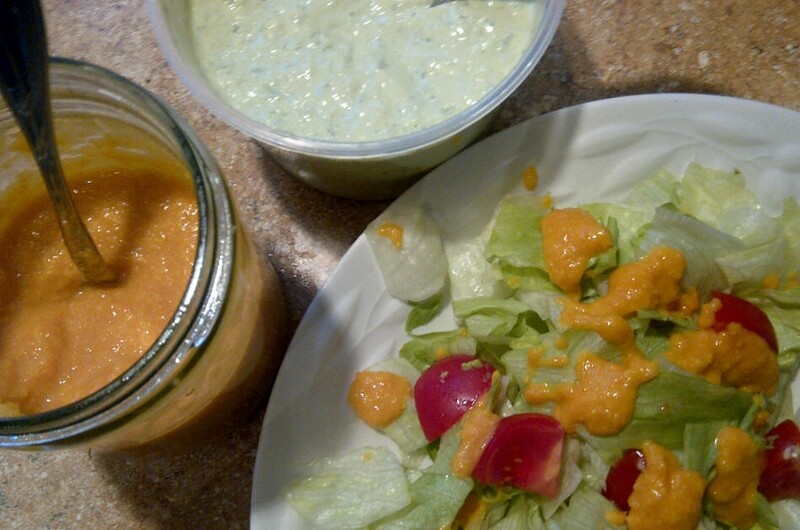 The “salad” was shredded lettuce, sliced tomatoes, sliced avocados, and typical burger dressing of light mayo and mustard. The guys loved it and never even complained about not having a bun! This was a heavier meal than what we’ve been eating most of the week, but every once in awhile, a little indulgence is good. 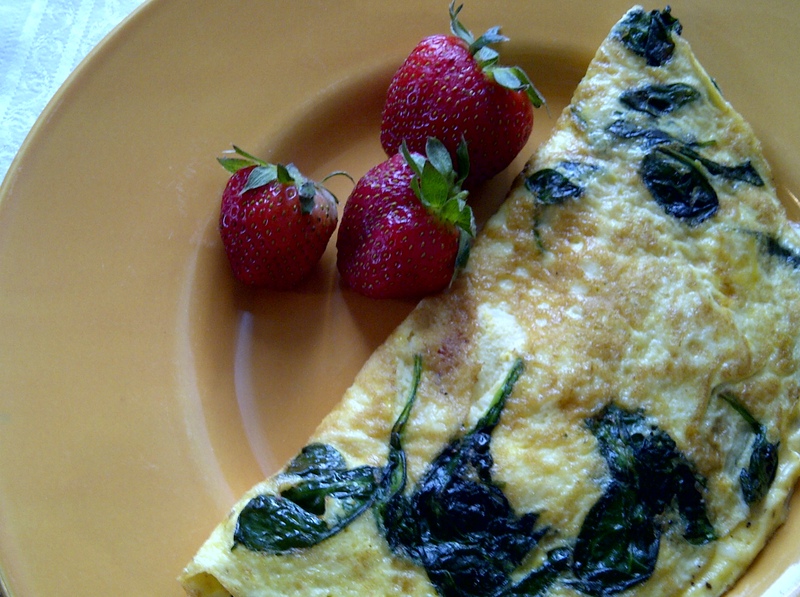 Simple and pretty, adding spinach to the eggs in an omelet makes for a visual treat and extra nutrition as well. I can't wait until I have garden-fresh tomatoes to add in this summer! 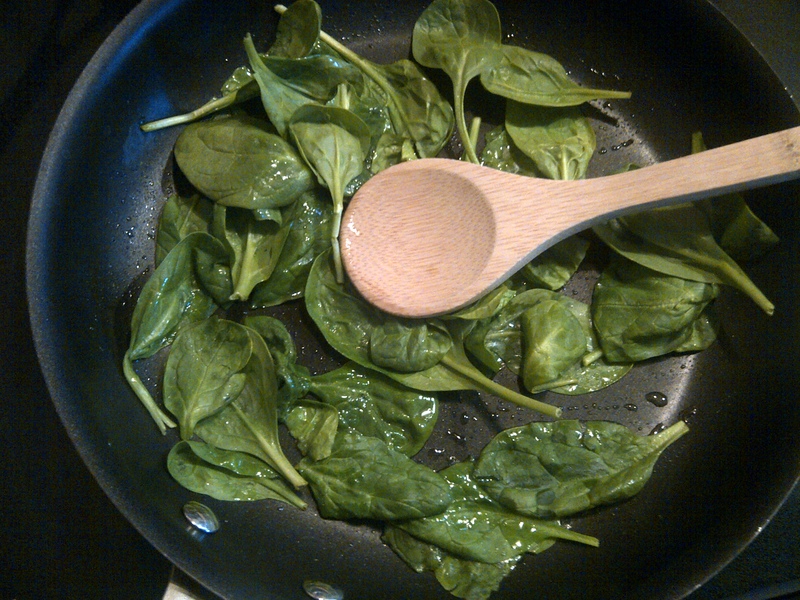 To begin with, I heated a 10" non-stock skillet with a couple teaspoons of olive oil, and added a nice handful of fresh organic spinach leaves. Continue to saute until they are wilted nicely. Next, arrange the spinach so that it is spread around the pan, add a teaspoon of butter (allowing it to melt), and pour in the 2 eggs which have been lightly beaten with about a tablespoon of water. After the eggs have been cooking (covered to steam) for a few minutes over medium-low heat, and the egg is appearing to be firmed with small bubbles, layer the cheese and tomato on one half of the omelet. They bring to mind crispy hash-browns and good coffee at diners we’ve visited throughout our travels. The variety and possibilities for fillings are endless and I’ve enjoyed so many different combinations. Greek style with lamb, tomato, feta… Philly Steak with mushrooms, onions, peppers and Swiss… Potatoes in, potatoes out… you get the idea! At our house we enjoy making omelets as well, and they range from something packed with leftovers, to simple and a little elegant. THAT is where the spinach comes in; spinach and eggs are a heavenly combination that should not be reserved only for quiche! I think the keys to a successful omelet are to use a non-stick pan large enough for the egg to spread out thinly, and to have the patience to cook it slowly over a lower heat so that the bottom doesn’t cook too fast, which leaves the middle gooey. I add water to my omelets instead of milk or cream, I just find that I like the results better, but you can use whatever works for you. To begin with, heat a 10″ non-stock skillet with a couple teaspoons of olive oil over medium heat, and add a nice handful of fresh organic spinach leaves. Saute these until they are wilted nicely. 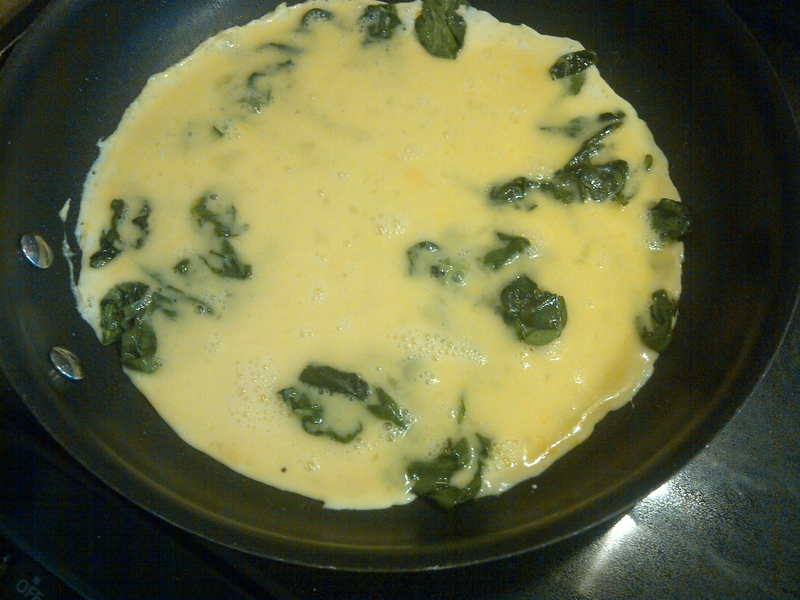 Next, change the heat to medium-low, arrange the spinach so that it is spread around the pan, add a teaspoon of butter (allowing it to melt), and pour in the 2 eggs which have been lightly beaten with about a tablespoon of water.Cover and allow to cook slowly for several minutes or until the egg appears semi-firm and may have small bubbles on the surface. Replace the lid after adding the fillings, to allow the cheese to melt and the omelet to finish cooking, just another minute or so. Carefully slide a flexible spatula under the edge that doesn’t have fillings, and flip it on top of the tomatoes and cheese. Slide onto a plate and garnish with berries!